20 grade 12 Bishops boys and 20 grade 11 Herschel girls meet three times a term to learn the dance steps to a variety of dances – waltz, quickstep, foxtrot, rumba, cha-cha, rock n’ roll, jive, samba and the Argentine tango. The final dance society evening of the year is an ‘old fashioned dance’ with dance cards, Paul Jones and various competitions. 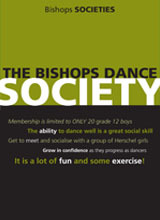 Dance Society meetings are held on Thursday nights from 19:45 – 21:15. We alternate meetings between the two schools.